Panasonic is a revered name in the electronics industry, and they’ve got more than a few specializations. One of these is cameras, namely cameras designed for high-end photography with all the features a professional or experienced hobbyist could ever need. Among Panasonic’s selection of cameras is the Lumix line. They look sleek, take great photos, and are designed to offer a seamless workflow for easy photo management. Usable by photographers of all skill levels, Lumix camera models are a great choice for beginning and expert photo enthusiasts alike. How Do We Choose Our Ratings? 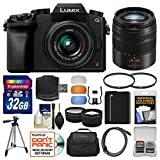 What is the Best Lumix Camera You Can Get in 2018? Buying Guide for Lumix Cameras: What Should You Know? Even in the Lumix line, there are plenty of options – and enough to make multiple categories. This includes the G DSLM cameras, which offer improved flexibility to high-quality images. 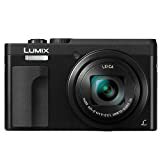 But there’s also the point-and-shoot variant of the Lumix camera, which comes in many models that allow people to carry it along on trips. What is the best Lumix camera on the market in 2018? This is a tough question, as even in this specific line there are multiple categories. Our list will combine options from both lines and compare features, price, and reputation when making the determination about which model ranks higher or lower. For this list, we’ll be focusing on a comparison between features and price. There’s no need to take the brand into account, as we’ll only be looking at the Lumix line. Since both the DSLM and point-and-shoot cameras have their own advantages, we’ll mix them in our list. We’ll take into account features and design, including the picture quality as well as the size-to-feature ratio. We’ll also consider how the features and design match up to the price. There’s a lot to be said for finding a good budget deal and saving money when buying a camera. However, cheaper doesn’t always mean better. If a person can spend another $50-$100 and get a camera that’s much more valuable, we’ll take that into account. Finally, we’ll be considering the reputation a camera has. Higher ratings by those who have purchased it indicate the camera excels where it counts in the field. A long list of features is great, but their ability to generate better pictures and a better experience constitute their true appeal. Here are our picks for the best Lumix camera options in 2018 – and all you need to know about each. This model cuts right to the chase with its main feature: a large sensor and a 20-megapixel resolution. This translates to better image quality, a perk aided by the 10x (25-250mm) LEICA DC lens with wide optical zoom performance for sharp image captures, with high levels of detail visible even in the backgrounds. This DSLR camera is one of the best Lumix models on the market. Is it the best out there? It’s definitely a well-rounded model that’s received a lot of positive feedback, making it an easy choice for our top spot. The same clarity is available for video recordings, as this model is capable of ultra HD 4K resolution. From the wide LCD screen to the automatic viewfinder features, this camera has plenty of design choices selected to make a photographer’s life easier and their shoot better. Moving over to the point-and-shoot style of camera, this model is designed to inspire creativity and improve workflow. Despite being relatively compact in its design, it has a large capture lens with strong sensor and great depth of field view. Its optical image stabilization technology helps you get a better shot without the blur. The point-and-shoot market has a lot of appeal. For those who want a Lumix camera of this style, the LX100 is a great choice. From great features to compact design, this model has it all. You can also enjoy 4K Ultra HD video capture with 30p capabilities. Choose between three aspect ratios and enjoy a sleek, compact design that makes it easy for you to pack the camera up quickly while still having access to great photos. Looking for high-quality zoom features and unmatched durability in a Lumix camera? The FZ300 may just be your perfect choice. It offers 24X zoom capabilities (25-600mm) thanks to the high-end LEICA lens, which also provides a full range of brightness capture. Its 12.1-megapixel resolution may not be overly impressive, but it still offers beautiful 4K video. Another great example of a camera that’s packed full of great features for a reasonable price. Coming in at just under $400 on the listing we found and praised by dozens of reviewers, it’s a great buy – especially for outdoor enthusiasts. You can take this camera out into the field without fear. It’s splashproof and dustproof, giving you the ability to use it in various environmental conditions. It also has image stabilization for both photos and videos, meaning neither high winds nor shaky hands will compromise your performance. This high-end model lands in the point-and-shoot category and comes with a 20.3-megapixel resolution with MOS sensor. There’s a three-dimensional color control installed to automatically detect and adjust hue, saturation, and brightness for optimal picture quality. Add in 2-axis optical image stability, and you’ve got a well-rounded device already. It’s another model that may be a little higher priced than some beginner/intermediate photographers would want to pay, but the features warrant the price. But once you throw in a live viewfinder, custom autofocus capabilities, and 4K/30p video recording capability with live crop? 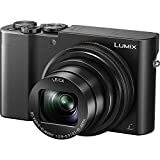 You’ve got one of the most well-rounded Lumix models in this category. Are you looking for a high-end camera that still lets you travel light? The GX85 fits that bill perfectly. It includes two compact lenses (12-32mm and 45-150mm), allowing you to get clear shots in a variety of lighting conditions and at various distances. You’ll enjoy the clarity whether you’re snapping pictures or recording video in stunning 4K Ultra HD detail. Crisp images and convenient design – what else could a photographer ask for? This versatile model hovers around the $600 range, and on Amazon alone, it has dozens of great reviews. It’s a great option to check out and can be great for nearly any situation. Image quality matters a lot, but what about the ease of use? Its thumbwheel control makes it easy to switch between modes and features. The large LCD screen makes it easy to see your work and know exactly what the shot will look like before you capture it. Even the noise level is low, thanks to the MOS sensor and Venus Engine. The ZS70K offers a 20.3-megapixel resolution with high-sensitivity MOS sensor. The result is incredible detail, combined with solid stability thanks to the 5-axis optical stabilization technology. The camera also offers 4K 30fps capabilities, providing the type of Ultra HD clarity that any photographer – or any viewer – will appreciate. 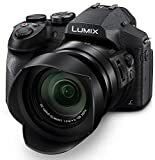 You get a lot of photo quality and a number of cool features with this Lumix – all for a price tag that hovers around $400 depending on where you choose to shop. For a budget camera or a beginner model, this is one of the best options out there. With this camera, it’s possible to get up close without actually moving your feet – thanks to the 30x optical zoom. This model also offers post focus or focus stacking. This means you can sharpen up an image right from your camera – even after you’ve already taken it! A great feature for amateur photographers and professionals alike. This camera is one designed to be simple but robust for the price. Most cameras in this range can be expected to offer solid picture quality. This one can sometimes surpass that, depending on the photographer’s standards, thanks to a 16.05-megapixel resolution and MOS sensor for capturing high-end JPEG and RAW stills. For this type of price range, it’s hard to find a better camera. The DMC-G7 offers great picture quality and has enough add-ons to round it out and make it more than worth its mid-tier price tag. This camera has a built-in flash function and is also weather sealed, meaning it can achieve great results in various light and environmental conditions. The camera is also compatible with Wi-Fi devices, enabling a smooth workflow for transferring pictures with ease. With its 14.1-megapixel resolution, 24x optical zoom, and 25mm wide-angle Lecia DC Vario-Elmarit lens, this camera has everything you need to get great pictures for the price range. Though it has been discontinued by Panasonic, it’s still a hot buy as it's evident by the number of positive reviews it has received. While it is easy to say that the modern Lumix options have surpassed discontinued ones like these, there are still a lot of reasons to like this camera. That explains why it is still purchased today even though it is out of production. You can even record HD movies, using the intelligent LCD screen and intelligent resolution technology to enjoy high-level clarity. Color mode helps provide a greater representation of various hues, while the intelligent auto mode can help speed up the shooting process. 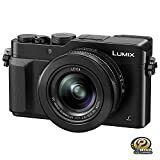 This is one of the most popular travel/beginner cameras in the Lumix line, coming in at a low price of only a couple hundred dollars on most sites and in most stores. But it’s not just a travel camera because of its low price but because of its design as well. It’s a solid camera, and a great one when you consider its category. For compact/travel/beginner models, it’s hard to find another model with this level of zoom and video recording capabilities. This model has a zoom feature with an eye viewfinder and enhanced low-light sensitivity. No matter how far off you are from your desired shot, you can feel close thanks to the 60x intelligent zoom feature. This camera also offers high-speed video, clocking it at 100fps in HD and double that in VGA. With a 12.1-megapixel resolution and interchangeable lens, this camera is a modest entry into the Lumix line. Though its price range may cause some people to be put off, it’s worth noting it has a compact and elegant design that also contributes to its value. It’s easier to cart around that many models and is one of the most space-efficient in the Lumix line. This versatile camera offers a lot of features for its price range and can hold up to other models of the same type/size. With a number of effects like face detection and intelligent exposure, it makes things simple for photographers of all experience levels. This model can record in 720p, meaning you can enjoy HD video. It also uses the “My Color” option, which includes seven presets that function like filters. It’s easy to give pictures and videos a unique look, thanks to this feature. Are you the type of person who values superb image quality over compact design? Or are you willing to sacrifice a little bit of clarity if it means being able to toss the camera into your pocket or purse? Depending on this, your choice of what type of Lumix camera to buy may differ from other photographers. You should always consider things like resolution, zoom capabilities, video recording quality levels, and of course, price. Don’t forget to look for added bonuses like image stabilization and Wi-Fi compatibility. They may seem like nice extras, but for many photographers, they’re an integral part of a normal, smooth workflow. Lumix is a great brand of camera, and it offers many great models. No matter your price range, this line offers something for every photographer – even those who are just starting out.